Amritsar is famous for its number of gurdwaras and Gurdwara Ramsar Sahib is one among them. It is situated on the north-western bank of the Ramsar sarovar north-east of the Golden Temple in Amritsar. Built in 1855, it was at this place where Guru Arjan Dev Ji, the fifth Sikh Guru spent over a year (1603-04) to compile the holy Granth (Guru Granth Sahib) of Sikhs which covers over1430 pages. He collected the hymns of first four Gurus, Guru Nanak, Guru Angad, Guru Amar Das and Guru Ram Das in this sacred book and also added his own compositions and writings of several Hindu and Muslim saints. Sukhmani, the Psalm of Peace, was also composed here by the Guru. Ramsar sarovar, the smallest of Amritsar's five holy sarovars was built by Guru Arjan Dev during this period (the other four holy sarovars are Amritsar (1586), Santokhsar (1587-88), Kaulsar (1627), Bibeksar (1628)) is named after Guru Ram Das (the fourth Sikh Guru). It is believed that taking a bath in this sarovar will make a person's mind internally linked with the God. The building is an exquisite example of Sikh architecture which has a small marble-lined hall topped by a gilded, fluted lotus dome. 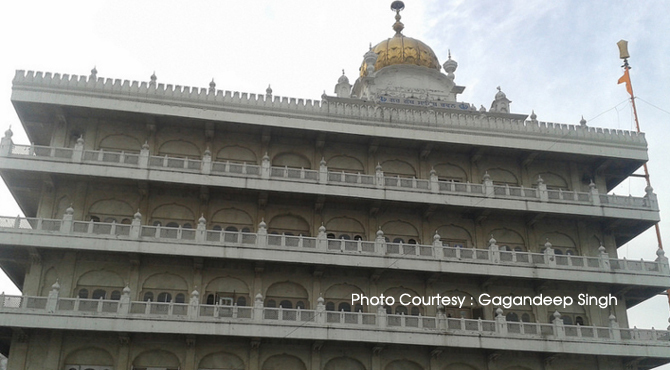 Inside the Gurudwara, there is a sacred pool from which it is customary for pilgrims to take a handful of water.